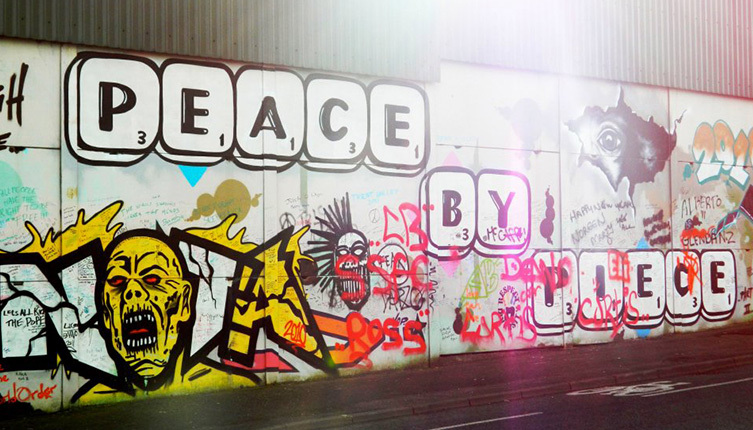 The central hub of Northern Ireland is a place thriving with history, culture and friendly faces. With so much to see and do, it can be difficult to squeeze it all into a day visit, luckily however, the city is small enough to navigate on foot, public transport or taxi. From historic murals to craic, here are some of the must-see places and delicacies you should add to your list. Found at all the best cafes and bistros, an Ulster Fry must be experienced when you come to this part of the world. It’s a take on the Full English Breakfast but with many more delicious carbs added. In one portion, you can expect sausages, bacon, eggs, mushrooms, tomato, baked beans, hash brown, potato bread, soda bread…and if that’s not enough, some places will throw in a bowl of chips to compliment. Local favourites include Maggie May’s or The Other Place based in the beautiful Queen’s Quarter with the Botanical Gardens located only moments away. The city is teaming with a huge selection of restaurants to suit all taste buds, most with reasonably priced and locally sourced cuisine. At the heart of the city centre stands City Hall – a magnificent building to behold. Tours run here daily for free, consult the Belfast City Council website to enquire about times. This is a great place to begin exploring with many other landmarks such as the Albert Memorial Clock just a stone’s throw away. Towards the docks under Samson & Goliath stands the Titanic Belfast, a multi-million pound attraction, the museum extends over nine galleries of interactive historic storytelling with special effects, dark rides and full-scale reconstructions of the most famous ship of the 20th century. Allow yourself a few hours to travel the depths of the ocean and uncover the true history of the Titanic from the city where it all began. In the west of the city lies the Peace Wall which divides the Shankhill and Falls Roads. This provides a great insight into the city’s history and culture with murals dotted throughout. The city centre is home to a state-of-the-art shopping mall, Victoria Square, with 3 floors of non-stop retail bliss; a shopaholic’s haven. Surrounding this, the city is home to a number of vintage boutiques and outlet stores. Looking for trinkets and lovely bits? Go no further than Avoca, the most loved homeware shop in Ireland. 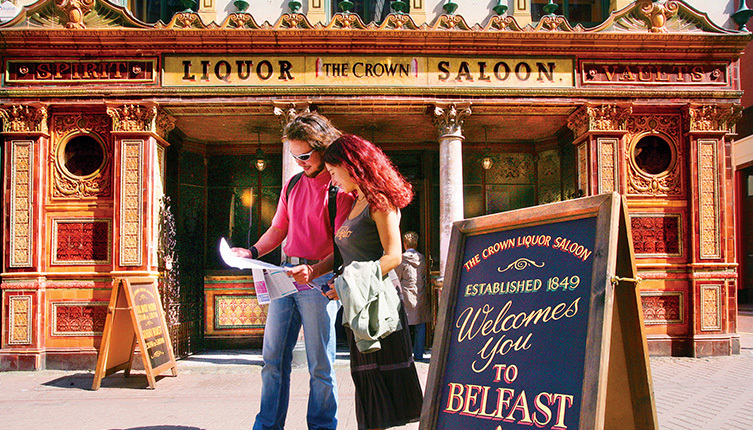 A visit to Belfast is not complete without a taste of Guinness from one of its many traditional bars. The Crown Saloon Bar stands opposite the most bombed building in Northern Ireland; this historic pub is the one of the best in the city to get a good glass of Guinness. Visit the Cathedral Quarter for a taste of local madness, with a huge selection of pubs found along cobbled alleyways. Favourites include the Dirty Onion, The Spaniard and the Duke of York where you’ll hear the live music before you see it. 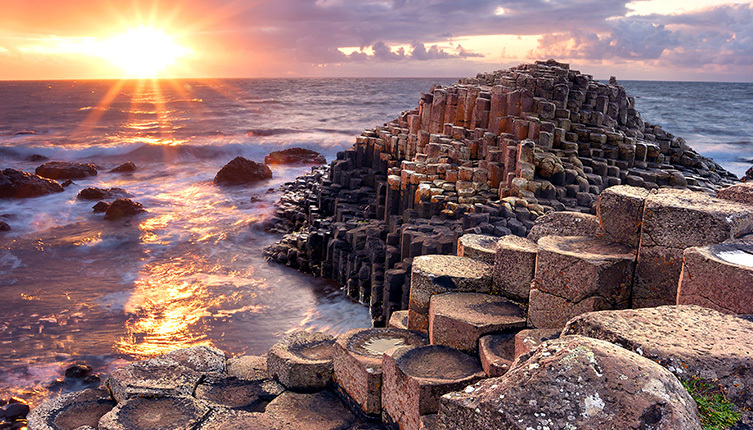 If you are planning on staying overnight in Belfast or only intend to see one thing – make it the Giant’s Causeway. A few hours coach journey away, this awe-inspiring spectacle is a natural-world wonder not to be missed. Day excursions can be organised in advance or tours leave from the city centre at 9am most mornings. A City Sightseeing coach tour is otherwise recommended as it offers a detailed tour of the whole city where you can hop on and off at your leisure. These also leave hourly from the city centre. You aren’t guaranteed to experience all the wonderful gems Belfast has to offer but sure enough you are guaranteed great craic, wonderful memories and most likely a new friendship with one of the locals. 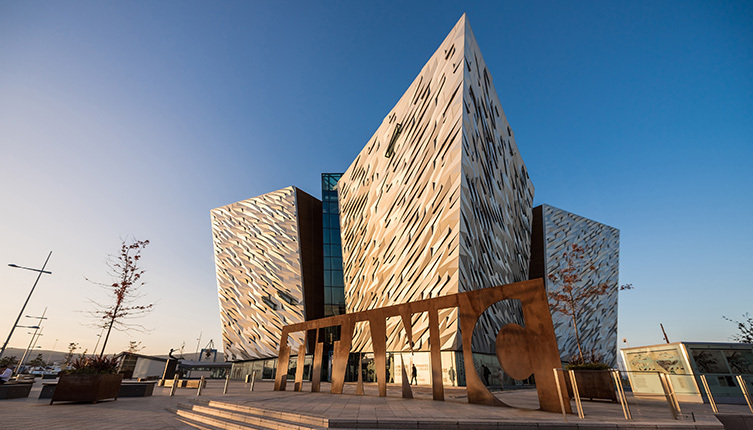 Spend your day in Belfast with a cruise to Belfast.